Dr. Okeke discusses general concepts on what glaucoma is and how it can affect your vision. Who Should be Tested for Glaucoma? Dr. Constance Okeke, a Board Certified Ophthalmologist at Virginia Eye Consultants, discusses who should be tested for the eye disease, Glaucoma. Do You Have Cataracts & Glaucoma? Dr. Okeke discusses treatment options available for patients who suffer from both glaucoma and cataracts. Minimally invasive glaucoma surgery, or MIGS, has been gaining wide-spread adoption as a treatment option that is easily combined with cataract surgery. Dr. Henry Jampel, of Wilmer Eye Institute, discusses the proper use of eye drops for treatment of glaucoma. Dr. Constance Okeke, a Board Certified Ophthalmologist at Virginia Eye Consultants, shares some good advice on ways to take care of your eyes. These include regular eye exams and not ignoring any symptoms you may have with changes in your vision. What Does Glaucoma Look Like? Dr. Constance Okeke, a Board Certified Ophthalmologist at Virginia Eye Consultants, explains what glaucoma does to a persons vision. Glaucoma can be diagnosed by early screening. Dr. Constance Okeke, a Board Certified Ophthalmologist at Virginia Eye Consultants, briefly discusses some of the new treatment options that are available for Glaucoma. These treatments are offered at the practice. Need Help Paying for your Glaucoma Drops? Talk to your doctor about any financial burden you may have with keeping up with your glaucoma drop regimen. There are many resources and often different types of drops that can be used to help you keep your glaucoma under control. 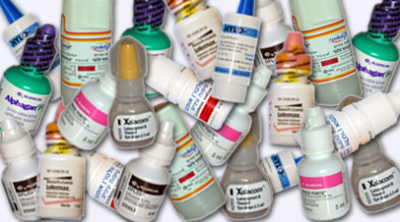 A list of companies and links for Patient Assistance Programs for glaucoma drops is available. Have you been recently diagnosed with glaucoma? Have you been living with glaucoma for a long time? There is always something new to learn about glaucoma that can help you or someone you know. Read below about some relevant topics and if interested in learning more, request topics for Dr. Okeke to cover. Amazing resource for up-to-date and practical information on living with glaucoma and research advancements. ​Great resource for finding well trained glaucoma specialists near you.